Loggerhead sea turtles, also known as Caretta carettas, are the apples of the eye in the Aegean and Mediterranean coasts. 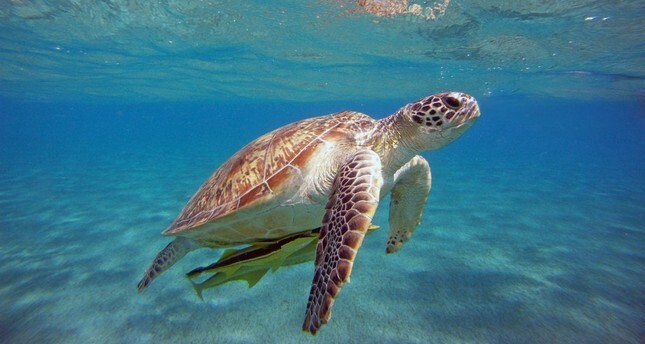 There are 21 Caretta caretta nesting spots in the Aegean province of Muğla and the Mediterranean provinces of Antalya, Mersin, Adana, and Hatay; however, there is no doubt that the most popular nesting area for these giant turtles are the İztuzu Beach in Muğla, which was taken under the government's protection in 2015. Every year, the Muğla-based Sea Turtles Research, Rescue and Rehabilitation Center (DEKAMER) puts a team of volunteers together to help Caretta carettas to build their nests and make sure that they are not disturbed by the locals or the tourists. Volunteers come to the beach in summer and every month at least a team of 100 volunteers take care of these giant turtles. The volunteers came to the beach from all over Turkey and over the last couple of years, the program also attracts international volunteers from the U.S., U.K. and Germany as well.The volunteers work as four divided teams and they are first instructed about the territory and how to assist the Caretta carettas. The team which is in charge of the territory is responsible for protecting the nests of the turtles day and night. The rehabilitation team, on the other hand, assists with the medical care of the turtles. Norven Abdurrahiym from Tunisia is one of the volunteers that have come to Muğla to help the turtles. "The nature, beaches and the people of Muğla are incredible. We are currently building cages for Caretta carettas to lay their eggs. We also help their rehabilitation during this process and make presentations to the visitors of the beach," said Abdurrahiym. The Tunisian volunteer will be staying in Muğla for five months. During his stay, he will assist the Caretta carettas of the İztuzu Beach and "learn Turkish from his friends." "I volunteered for everything that involves helping Caretta carettas. I work hard to keep them healthy and safe. This kind of volunteering job makes me happy. From now on, I will try to come to the İztuzu Beach as a volunteer every year," Abdurrahiym added.